09/14/18 — When we got called today by Texas City Police Department asking us to start a search for Marie Powers, we feared there would be a devastating outcome. 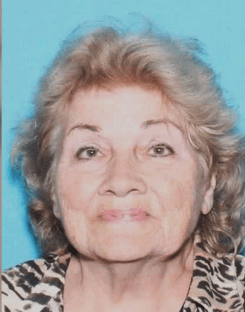 Due to the great job of everyone involved in the search, Marie Powers has been found safe. She is being reunited with her family. Thank you to everyone who helped bring her home. 09/14/18 — Marie Powers, age 79, was last seen on Wednesday, September 12, 2018, near her residence in the 2900 block of Tarpey Avenue in Texas City, TX. Marie suffers from Alzheimer’s disease and bi-polar disorder. Marie was last seen wearing a pink and white night robe. If you have seen Marie Powers, or have any information of her whereabouts, please call the Texas City Police Department at (409) 643-5720 or Texas EquuSearch at (281) 309-9500.